This gold level event of the Freeride Mountain Bike World Tour brought the best athletes together to compete on a course with huge features. The 2012 Teva Mountain Games had the biggest field of riders ever with all the top riders in the FMB point standings. The Maple Street Bike Park is a few miles from Kyle’s house in Essex Junction,Vermont. The park features a pump track and 3 dirt jump lines ranging from beginner and intermediate tables to a line of big big doubles for the expert riders. 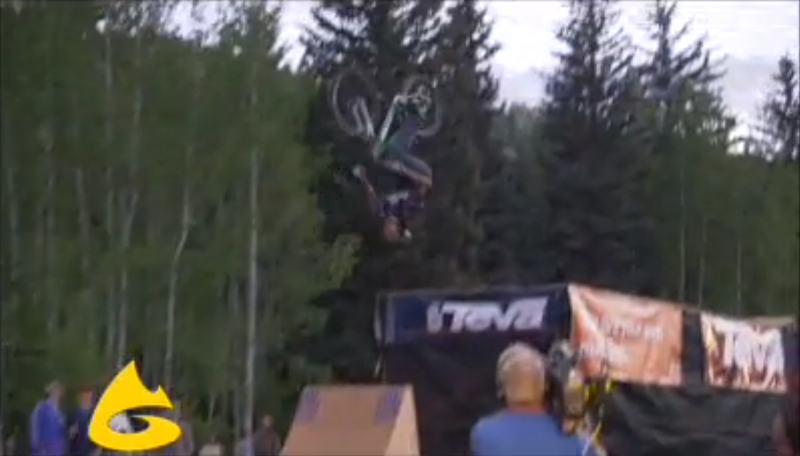 Crankworx Colorado was the biggest course ever with every feature trickable and big finishing jumps. The Teva Mountain Games slopestyle competition is a silver rated event on the Freeride Mountain Bike Association World Tour. Kyle has been the slopestyle course designer since 2005. In this video Kyle describes the course as riders trick each jump. Kyle worked with ADK Trail Coordinator, Matt McNamara, and local kids to build this jump park behind the Wilmington Youth Center. Kyle has designed, built, and competed in the Teva Mountain Games slopestyle event since 2005. For the filming of Kranked 7, Kyle built trails in the Northeast Kingdom of Vermont for sections featuring Kyle and Timo Pritzel. IMBA teamed up with Kyle Ebbett and Jeff Lenosky to build the first legal trails in NYC. Kyle has built Mountain Cross, Dual Slalom and Speed Trials Courses for the Sea Otter Classic. His first Mountain Cross design featured lots of rhythm that the pros sessioned for hours. Mountain Bike Rider in the UK ran the photo at left. Kyle is the racer on the far left. The mobile phone company, Movistar, hosted a music festival in Pananma City. Kyle was hired to design and build a terrain park to host the dirt jump exhibition of the Festival. Kyle sessions his jumps at left. The Red Bull Bike Battle in 2003 was a head to head competition of the world’s best urban freeriders. Kyle got the pleasure of building dirt jumps in Boston’s City Hall Park.